National Instruments data acquisition (NI-DAQ) devices can be integrated with OptiTrack motion capture systems. Through NI-DAQ devices, analog signals from various devices (e.g. transducers or EMG sensors) can be converted into digital signals at a user-defined sampling frequency, and they can be precisely synchronized with the tracking data in Motive. This page provides instructions on connecting NI-DAQ devices and acquiring analog signals within Motive. Please refer to the Supported NI-DAQ Models section of this page for a list of supported models. 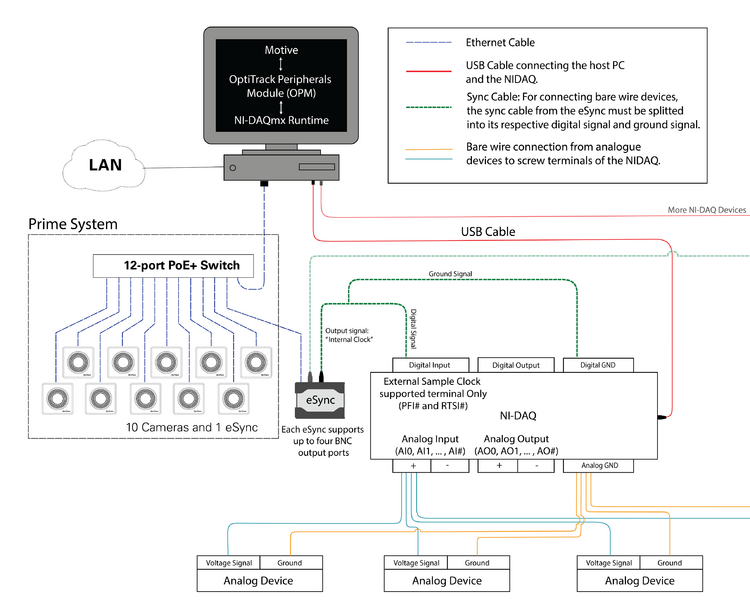 Integration of NI-DAQ device(s) uses the Peripheral Device module to register, initialize, and record using the connected DAQ device(s). When properly configured, voltage signals of up to 32 analog channels per each connected NI-DAQ device can be sampled along with the tracking data. Recorded analog data can be saved into the Take (.TAK) file and the data can be exported into C3D and CSV files for further analysis. The eSync synchronization hub must be used for precisely aligning recorded signals with tracking data. 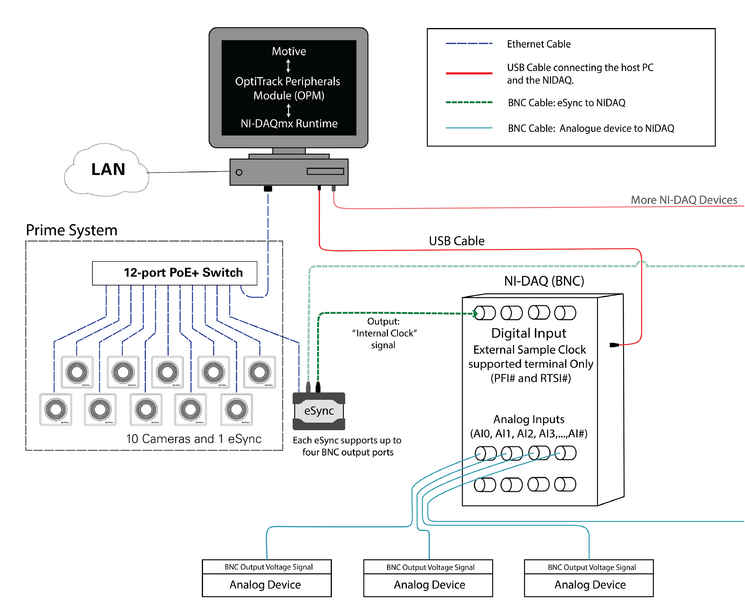 NI-DAQ device(s) synchronizes with a camera system by syncing with the internal clock signal outputted from the eSync. For this reason, NI-DAQ device(s) must support the sample clock signal input and connect to the camera system through the eSync. Motive 1.10 and above with a valid license. 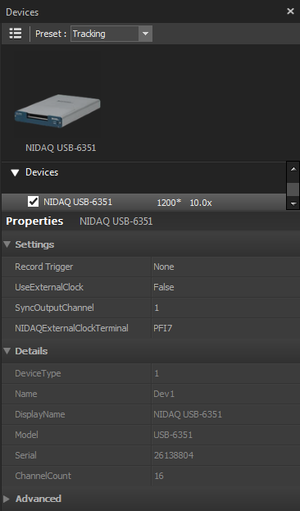 NI-DAQ device(s): PCI or USB. See more at Supported Devices. Follow the Force Plate Setup guide for the digital force plate integration. Implementing analog platforms through NI-DAQ devices will only detect the voltage signal, and the force plate features within Motive will not be supported. Synchronization with the OptiHub and a USB camera system can only be accomplished by trigger sync only. Motive supports PCI and USB data acquisition devices from National Instruments. A list of supported models can be found in the supported devices section. Wiring the eSync and the NI-DAQ device: Connect one of the output ports of the eSync into a digital input terminal of the NI-DAQ device that supports external sample clock inputs. For screw input terminals, ground signals must be separated from the BNC output of the eSync and relayed into a digital ground terminal. Wiring analog devices with the NI-DAQ device: Connect the output of an analog device(s) into one of the analog input channels of the NI-DAQ device. For screw terminals, a corresponding ground signal needs to be connected to an analog ground channel. For BNC terminals, wiring the ground signal is not necessary, but the input ports should be configured to either FS (Floating Source) or GS (Ground Source) setting depending on the characteristic of the signal source. For more information on connecting peripheral devices into an NI-DAQ device, visit NI support. OptiTrack mocap systems use the eSync to provide highly accurate synchronization. In Motive, the eSync will be configured to output internal clock signals and used as the master reference clock which other devices can synchronize to. In order to utilize the clock signal, a NI-DAQ device(s) that supports external sample clock input must be used. When using DAQ devices without the sample clock support, they will not be able to reference the clock signal. In this case, the device will have to sync at the start of the recording and operate in the Free Run mode with independent acquisition rate which may result in synchronization drift over time. Below is the list of NI-DAQ device models that are supported with Motive. For best compatibility, use the recommended models or verified models since they are most tested and approved to work with Motive. Unverified models should work as well, but their integration has not beenbeen verified yet. For Motive to communicate with NI-DAQ devices, the OptiTrack Peripheral Modules must be installed along with Motive and NI-DAQ device drivers. The OptiTrack Peripherals Module is a software plugin package that bundles and installs required drivers and plugin DLLs for integrating external devices, including NI-DAQ devices and force plates (AMTI and Bertec). The following section describes the steps to integrate NI-DAQ device(s) within Motive. In the Devices Pane, all of the connected NI-DAQ devices will be listed along with respective analog input channels (up to 16) within the Devices group. The devices will also be listed under the Assets pane. 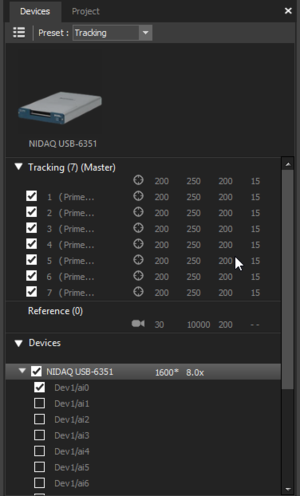 If you have multiple NI-DAQ devices that are the same model, please make sure and assign unique names for each device on Assets pane. 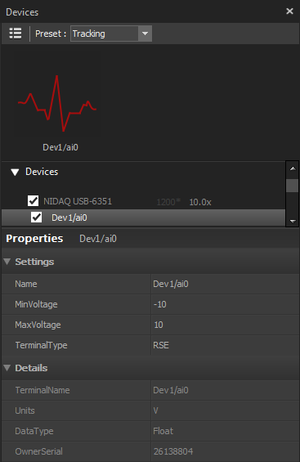 Once the NI-DAQ device is recognized properly, you will be able to observe the live sampled signal on the Graph View pane. d. Timeline Pane: Show the 'Scope' View. Recorded signal from the NI-DAQ channel displayed on the Timeline pane in Motive. 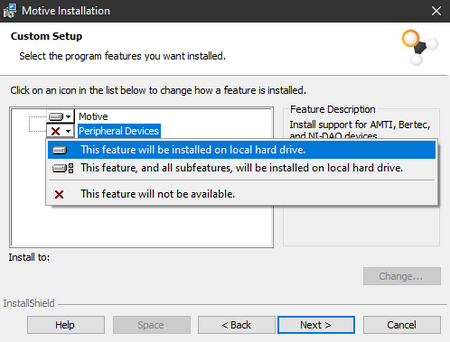 Now that the device is recognized by Motive, you can select and configure the device and its channels under the Devices pane. Analog channels of each device will be listed. For better identification of the channels, you can also rename them in the Devices panel to more descriptive names; such as the signal types or name of the connected device. This setting determines how the recording of the selected NI-DAQ device will be triggered. Setting it to True will use hardware data packets to trigger the record start frame. Setting it to False will trigger the recording when Motive starts capturing data. Sets whether an external clock signal is integrated. For precise synchronization using the internal clock signal sync, set this to true. True: Setting this to true will configure the selected NI-DAQ device to synchronize with an inputted external sample clock signal. The NI-DAQ must be connected to an external clock output of the eSync on one of its digital input terminals. The acquisition rate will be disabled since the rate is configured to be controlled by the external clock signal. When the Use External Clock setting is set to False, acquisition rate for NI-DAQ device(s) can be set individually in the Devices pane. 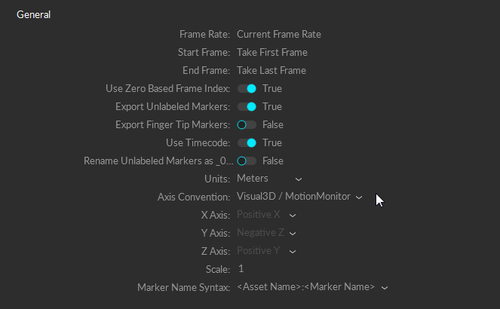 You can modify the multiplier to change the acquisition rate to multiples (up to X16) of the camera frame rate. This sets the acquisition rate of the NI-DAQ devices when synchronizing without an external clock signal from the eSync. In this case, the devices will be running at the Free Run mode, and the NI-DAQ device(s) and the cameras will be triggered simultaneously but they will capture at their own sampling rate. Synchronization drift will be introduced over time when using the free run mode. Name of the NI-DAQ digital I/O terminal that the external clock (TTL) signal is inputted to. 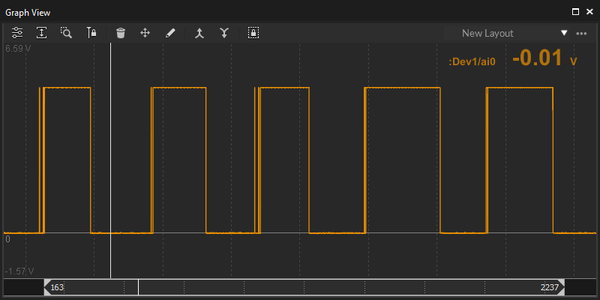 NI-DAQ device synchronization configuration using the internal clock signal from one of the eSync output. The above configuration sets the camera frame rate at 100 Hz and sets the acquisition rate to 1000 Hz as defined in the Clock Freq setting. In order to precisely synchronize the motion capture system with NI-DAQ devices, the eSync must be used. Particularly, the internal clock signal from the eSync is delivered into the NI-DAQ devices and referenced as the external sample clock. To accomplish this, set the Sync Input to Internal Clock under the Custom Synchronization settings. Here, the clock frequency of the internal clock signal can be adjusted for controlling the sampling rates of the NI-DAQ device(s). Then, the input divider/multiplier can be adjusted to set the camera frame rate. The Final Frame Rate of the internal clock signal will set the frame rate of the camera system. 2. [Motive]: Open the Synchronization Pane and the Devices pane. 3. 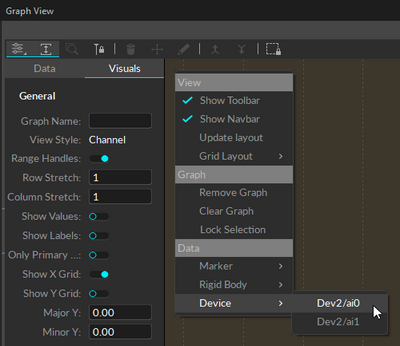 [Motive: Synchronization Pane]: Select Custom Synchronization from the dropdown menu. 4. [Motive: Synchronization Pane]: Configure the Sync Source to Internal Clock. 6. [Motive: Synchronization Pane: Sync Input (Internal Clock)] Set the Clock Freq to desired acquisition rate of the NI-DAQ device(s). 7. [Motive: Synchronization Pane: Sync Input (Internal Clock)] Adjust the Input Divider to configure the resulting Final Frame Rate which will be used to synchronize the cameras within the system. In order to accurately sample analog signals, the acquisition rate of the NI-DAQ device(s) should not be greater than X16 of the configured camera frame rate. In other words, the Input Divider should not exceed 16. 8. [Motive: Synchronization Pane] For the eSync output ports connected to the NI-DAQ devices, set the Output(N) Type to Gated Internal Clock. Now the internal clock signal is configured to be outputted through the output(N) port into the connected NI-DAQ channel. 9. [Motive: Devices Pane] Within the NI-DAQ device property, set the Use External Clock to True. The NI-DAQ sampling rate in the Device Panel should now display the eSync Internal Clock rate. 10. [Motive: Devices Pane] Under the NI-DAQ device properties, designate the NI-DAQ External Clock Channel to the NI-DAQ digital input terminal connected in Step 1. 11. [Motive: Timeline Pane] Record. The recorded NI-DAQ device samples will be synchronized with the external clock signal. The OptiHub is not supported for synchronization at this time. The OptiHub does not feature clock signals, and for this reason, precise synchronization of NI-DAQ devices cannot be achieved. 1. [Motive : Device Panel] Configure NI-DAQ collection channels properties (terminal type, voltage range). 2. [Motive : Device Panel] Enable the channels to collect by checking the box next to each channel. 3. 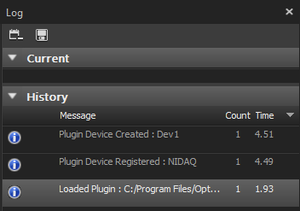 [Motive : Device Panel] Configure NI-DAQ device properties (Acquisition rate, external clock). 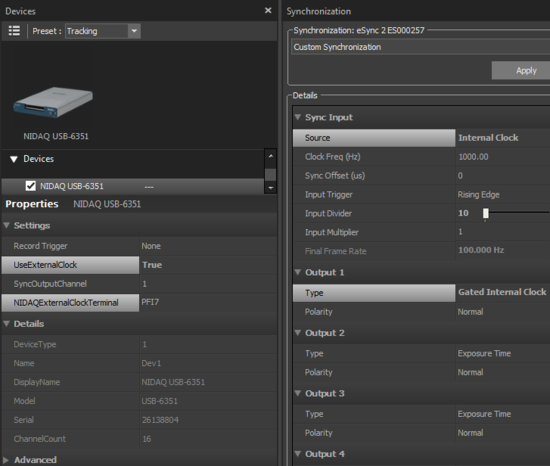 Set the Use External Clock to true for synchronization through the eSync. 4. [Motive : Device Panel] Enable the NI-DAQ device by checking the box next to the device. 5. 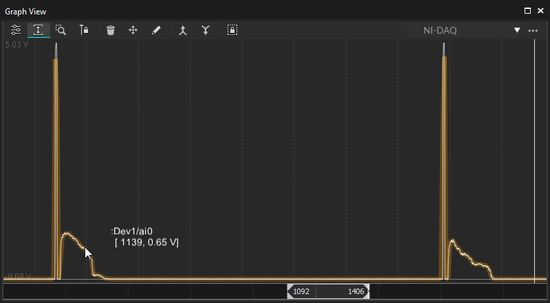 [Motive : Timeline] In Live mode, scope the timeline to verify the recorded channel/terminal signals appear correctly. 6. [Motive : Timeline] Start Recording. A - If the device is configured to use external clock signals, the option to change the acquisition rate for NI-DAQ devices within Motive will be disabled. Set UseExternalClock to False to use the Free Run mode. This page was last modified on 22 June 2018, at 11:32.